Dress-up turns deadly. . .
Because Cassie’s capture wasn’t accidental, and the Dollhouse is more than just a prison where her deepest fears come true—it’s a portal for the powers of darkness. And Cassie may be the only one who can stop it. This book was one crazy, creepy, truly disturbing ride! When I read the synopsis for Dollhouse, the first thing that popped into my head was the movie, Jeepers Creepers. Not necessarily a scary movie, but definitely a strange one, and since horror is something I enjoy, I jumped at the chance to review this book. While not exactly scary, it definitely has some of the same creeptastic vibe as Jeepers Creepers. Cassie, Ethan, Aisha and Lacey head into the mountains one day to complete a school project. On the way out of the woods, there is an altercation of sorts, and Aisha runs. She never comes back. Ethan is being looked at as a suspect, so to clear his name he goes to the woods to find Aisha and bring her home. Cassie who loves him so much, and Lacey decide to go after him and help him so they can all come home. What happens instead is nothing short of the worst nightmare imaginable for the three. I don't want to give anything away, just for the pure shock factor of the story. I will just say that there are animated, life-sized dolls, a very creepy girl, and a basement full of serious surprises....and not the good kind. The author paints such an imaginative picture that I could close my eyes and see what the characters were facing, and I can say that I would not want to be in their shoes. Speaking of characters, Cassie is a good one. She is fierce and loyal and protective, and she never stops fighting, never gives up, no matter how hopeless it seems. Lacey is a good character, but she isn't what she seems. Aisha is a mean girl, it seems, but in the end I really liked her. Ethan is okay. Not the best, not the worst. The rest of the characters are very well drawn, and definitely have their own personalities. 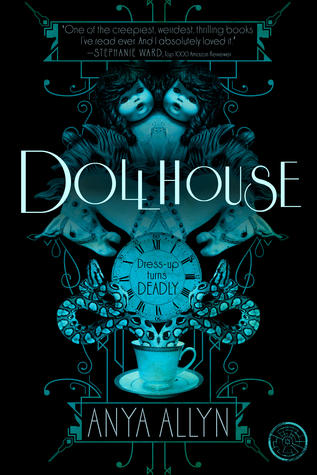 I would recommend Dollhouse to people who love a little bit of creepiness, but can't handle full blown horror. It is a quick, fun and fast-paced story, and the ending will definitely leave you wanting more!